Just returned from an idyllic vacation at one of our resorts? About to take off for the Caribbean and craving a head start on your tropical getaway? 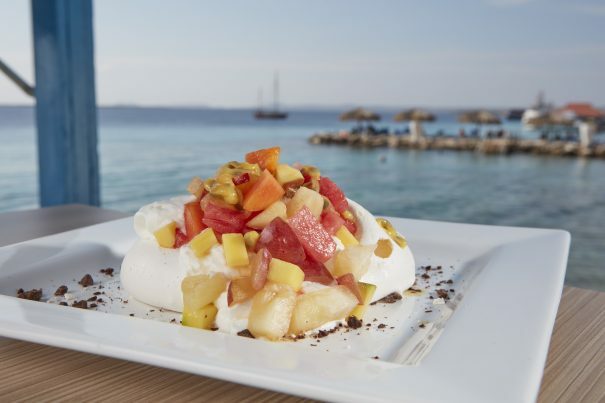 If you’re in the mood for a taste of Bonaire, Chef Antonio Bruni, executive chef of pureocean Beachside Dining and Chibi Chibi Bar & Restaurant at Divi Flamingo Beach Resort & Casino on Bonaire, shared his recipe for pavlova with us. Pavlova is a soft, light meringue dessert topped with fruit—perfect for enjoying on a hot summer day. Preheat oven to 220 degrees Fahrenheit. Whisk the egg whites with an electric or hand mixer until stiff. Adding sugar 1 tbsp. at time, whisk in the vinegar, corn flour, and vanilla pod until the mixture looks glossy. Using 2 tablespoons, scoop the meringue into a dish covered with parchment paper, give it a shape you like, and create a nest in the middle to fill with the topping later. Bake for 1 hour, then turn off the oven, and let the pavlova cool completely while inside the oven. Whip the cream with 3 tbsp. of caster sugar. Place 2 scoops of cream in the center of the pavlova, add 2 more tablespoons of fruit salad on top the cream, and serve. This May and June also mark Bonaire Cuisine Months, a celebration of Bonaire’s growing culinary scene. Tourism Corporation Bonaire created this annual two-month period to help introduce Bonaire’s wide variety of excellent fare to the world. If you’re on Bonaire, make sure to stop by pureocean Beachside Dining and Chibi Chibi Bar & Restaurant at Divi Flamingo Beach Resort! Chef Antonio will appreciate your support of Bonaire’s exciting cuisine.